Christina Hoff Sommers (born 1950) is an American author and former philosophy professor who is known for her critique of late 20th century feminism, and her writings about feminism in contemporary American culture. Her most widely discussed books are Who Stole Feminism? How Women Have Betrayed Women[wp] and The War Against Boys: How Misguided Feminism Is Harming Our Young Men. Although her critics refer to her as anti-feminist, Sommers thinks of herself as an equity feminist who faults contemporary feminism for "its irrational hostility to men, its recklessness with facts and statistics, and its inability to take seriously the possibility that the sexes are equal - but different." Christina Hoff Sommers is a resident scholar at the American Enterprise Institute[wp] in Washington, DC. Before joining AEI, she was a professor of philosophy at Clark University[wp] where she specialized in moral theory. Her academic articles have appeared in publications such as The Journal of Philosophy and The New England Journal of Medicine. She has also written for The Wall Street Journal, The New York Times, The Washington Post, The New Republic, The Weekly Standard, and The Atlantic. Sommers is editor of Vice and Virtue in Everyday Life, a leading college ethics textbook, and the author of the bestselling books Who Stole Feminism? 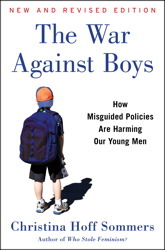 and The War Against Boys - the latter was a New York Times "Notable Book of the Year" in 2000 and was re-released in 2013. Her most recent books include One Nation Under Therapy and Freedom Feminism. Sommers has appeared on numerous television programs, including Nightline, 60 Minutes, the Oprah Winfrey Show and twice on Comedy Central's The Daily Show. She has lectured and taken part in debates on more than one hundred college campuses. Christina has two adult sons. She and her husband live in Chevy Chase, Maryland. This page was last modified on 10 December 2017, at 08:50. This page has been accessed 3,962 times and contains 5,920 characters or 806 words.